Quality Pest Services, Inc. specializes in wood destroying insects, general pest control, and rodent control. We offer one time treatments necessary for the sale of a home, as well as quarterly maintenance plans for the discerning homeowner. First, and possibly most important, are the wood destroying insects.A wood destroying insect infestation can be controlled, but due to their prevalence in the area, and their ability to damage your home, we recommending calling Quality Pest Services, Inc. at the first signs of any activity. Carpenter Ants – the National Pest Management Association states that ants are number one nuisance pest in the United States; carpenter ants being the most damaging and costly. These ants do not actually ingest the wood like termites do; rather they tunnel through the wood to create their nest. Carpenter ants can often leave behind piles of sawdust (called “frass”). Carpenter ants primarily attack wood that is or has been wet and/or damaged. 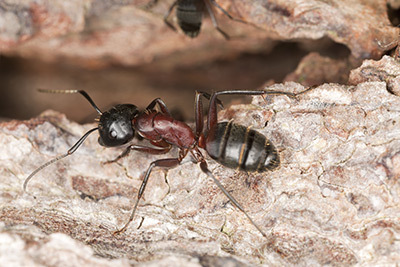 Carpenter ants look just like any other ant, but they are quite large, ranging from ¼ to ½ inch in length. Carpenter Bees – Carpenter Bees look like extra-large bumble bees, often lacking the yellow stripes. They bore perfect holes into wood in which they make their nest. Carpenter bees are solitary, living alone and laying their eggs in the holes they create. They hibernate in these holes over the winter, and can reemerge in the spring. Carpenter bees are a property threat, and can create damage over time. Powder Post Beetles – Some say that powder post beetles are second only to termites in their ability to destroy wood. Powderpost beetles lay their eggs in cracks of wood and the larvae tunnel into the surface, filling it with a very fine powder-like dust. Powderpost beetles attack dry wood, and can often be found destroying basement joists or hardwood floors. General Pests/Occasional Invaders are the insects that do not damage your home but can be quite a nuisance. Call Quality Pest Services, Inc. to assist with any of your general pest control concerns. Make sure to talk to us about starting a maintenance plan to ensure a pest-free home year round. Ants – There are more than 700 ant species found in the U.S., although only about 25 species commonly infest homes. Ants are social insects that typically live in underground colonies, made up of workers and a queen. Ants will eat practically any kind of food, but are especially attracted to sweets. Ant identification is relatively simple due to their three distinct body regions: head, thorax and abdomen, as well as antennae. Ants can also have wings and swarm to create a new colony. Ant swarmers can be differentiated from termitesswarmers in the fact that ants swarm mid-end of Summer, they have the 3 body parts, and their wings are separated (like that of a fly). Please contact Quality Pest Services, Inc. for an inspector to correctly identify the type of ant, and recommend an appropriate treatment plan. Roaches – Cockroach control and management are important for health and safety reasons, because cockroaches are known to cause allergic reactions and trigger asthma attacks, especially in children. They also spread nearly 33 kinds of bacteria including E. coli and Salmonella. In the Western Pennsylvania region, we typically encounter 3 main types of cockroach; the German roach, Oriental cockroach (“waterbug”), and American cockroach (“palmetto bug”). The most prevalent being the German roach. German cockroaches can squeeze into a cracks as small as 3/8 inch, and can reproduce 6 generations in a year. Wondering how to get rid of cockroaches? The best advice for cockroach control is to practice good sanitation. To prevent cockroaches from infesting the space, vacuum often, keep a spotless kitchen, seal all entrances around utility pipes and ventilate crawl spaces to prevent moisture buildup. Stinging Insects – Stinging insects like bees and hornets send more than 500,000 people to the emergency room each year. These pests are especially active during the second half of summer and early fall when the colonies forage for food that will sustain their queens during the winter. In the area, we often experience yellow jackets, ground bees, bald faced hornets, and wasps. A nest can be quite obvious, and hanging somewhere, it can be under ground, or it could be in the walls of your home. At any indication of activity, call Quality Pest Services, Inc. for an assessment. Spiders & Centipedes – Most house spiders and centipedes are considered nuisance pests, and are largely unharmful. Centipedes, sometimes called “thousand legger bugs,” are nocturnal and can feed on smaller insects. They prefer damp areas such as basements, bathrooms, and plants. 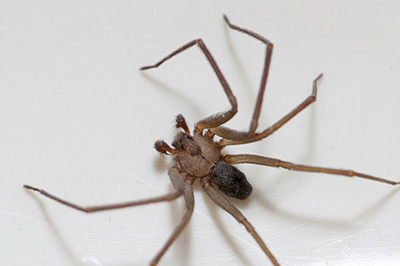 Like centipedes, spiders in a house also prefer the dark, damp areas. To prevent common house spiders from entering the home, seal cracks and use screens on windows and doors. Use a vacuum to remove adults, egg sacs and webs. Both spiders and centipedes can be controlled with a general pest treatment. Call Quality Pest Services, Inc. today to schedule an appointment.